2009 " Nature Peace" Geumgang Nature Art Pre-Biennale, Nature Art Movement by Yatoo. Gongju, Korea. 2000 "20th. Contemprorary Istanbul Artists Exhibition". Maya Plastic Arts Center, Istanbul, Turkey. 1997 "18th. 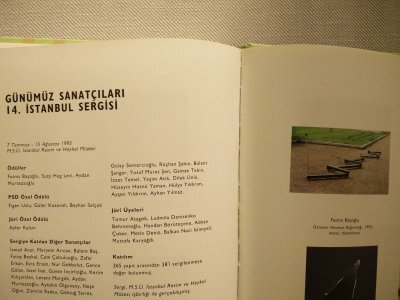 Contemporary Istanbul Artists Exhibition". Ataturk Culture Center, Istanbul. 1993 "14th. Contemporary Istanbul Artists Exhibition". State Painting and Sculpture Museum, Istanbul.